1 Heat oil and ghee in a heavy bottomed vessel, add few curry leaves, cloves, cinnamon, cardamom, pepper corns and saute for few secs till the aroma emanates the kitchen. Add garlic slices and saute for for few secs. Add ginger paste and saute for few secs. Add the green chillis and sliced onions and fry for 4 mts. 2 Add turmeric pwd and combine. Add the chicken pieces and cook over medium heat for 7-8 mts. 3 Add the thin coconut milk and salt and combine. Cook without lid for 5-6 mts. Add garam masala pwd, fennel pwd and potato cubes and place lid. Simmer till the chicken and potatoes turn tender and the gravy thickens. Turn off heat. 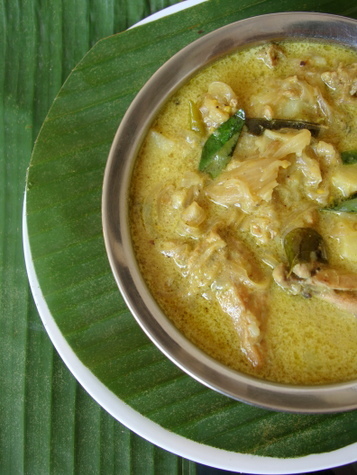 Add the thick coconut milk, few fresh curry leaves, lemon juice and pepper pwd and combine. 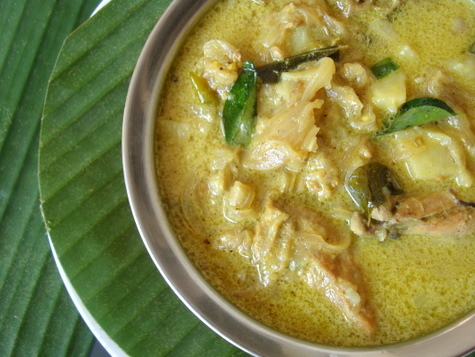 4 Serve warm with appam, rice or roti. I detest the taste of coconut in my food. Can I leave out the coconut? Will it taste good without the coconut? Coconut is an integral part of this recipe and you cannot omit it. you can also use full cream milk instead of coconut milk. just add it at the end after cooking the chicken. the taste is not compromised at all and is a good substitute for people who dont like coconut. the photo is very tempting.. is it okay to add the thick coconut milk after switching off the gas.. won’t the dish have to be quickly consumed in this case? Absolutely fine to use thick coconut milk after turning off the gas. You will have to finish the dish in a day or refrigerate for a day at the most. This looks very authentic. Stew and Appam is my favorite. My friend’s Mom used to make this for me whenever I visited her. Anything that has coconut milk is not healthy to my knowledge…yes it will definitely enhance the taste. It doesn’t need to be, i have been eating such food from my childhood, it hasn’t been a problem for me. Thank you so much for doing the hard work and posting exotic recipes. Looks very very good & tempting… Bookmarked it & would try some day…. I bet it is DIVINE with appams….. I am enjoying the taste in my mind & soul already….. God Bless!!!! Chicken stew is our family favourite and we always order it from a nearby restaurant…now your awsome recipe would help us make it at home. Thanks a ton !!! I am not familiar with “thin” and “thick” coconut milk… Here we have canned coconut milk, young coconut juice, and coconut water. What should I use or substitute? The first extract of coconut milk is the thick milk (add a cup of water to 2 cups of grated coconut, blend and strain = thick coconut milk). The second extract of coconut milk is thin milk (to the grated coconut which has been blended earlier, add another 2 cups of water and blend again and strain = thin coconut milk). What you can do is divide the canned thick coconut milk extract into two. Add 2 cups of water to one part and use that as thin milk while the other part can be used as thick milk. From the consistency I notice from the canned coconut milk, I would say add about 10-15% water and you would still have thick coconut milk. Young coconut juice would be the same as tender coconut water I suppose. It would be a beverage by itself. another winner from you.. looks amazing and chicken looks tender and juicy..
as one of your visitors suggest, please think about watermarks in the pictures.. Your recipe turned out awesome!! I’ve been wanting to make stew & aapams for ages & wasn’t very sure about the recipes I had seen previously. However everything I try from your website comes out great! I think it inspired me to take the plunge & try it. I think its made a believer of my husband as well…heh. Thanks so much & keep the recipes coming! Thank you soooo much. Tried this with the children last night and they loved it. I have been trying to ages to get them out of their bad eating habits and your chicken stew done the trick. They’ve been just asking me can they have it again tonight!! Can you omit curry leaves….I don’t have any available. I have bay leaves kasori methi can I substitue either? Omit the curry leaves and do not use any substitute. I made this just now and it turned out great! Thanks for yet another yummy recipe:-) Could you please post the recipe for making appam as well? mmmm….appam/stew my favourite breakfast combo. I have been following my mom’s recipe, which is almost similar to yours, except I don’t add any lemon juice (tastes yummy even without it). Your stew looks absolutely delicious and inviting. I enjoy cooking and your site has been one of the best I have visited thus far. Sailu you are doing a great job posting these great recipes. Just finished eating the stew i made! had to come back and tell you how amazingly your recipe worked! thanks! Did it the second time !!! And still tastes really good !!! Can I multiply the quantity mentioned if more required.. say for 40 or 50 people? Sorry for the delay. Use 5 kgs chicken and follow the recipe accordingly. It should be enough for 40 people. thank u for ur detailed recipe, made it as a new year supper spl. (sorry to come back so late to thank u) it was yummmmmmy!!! Hi Sailu, I tried your kerala chicken stew.. It came out really good.. I am a mangalorian and I used to have it with neer dosa from cochin bakery.. It was amazing.. This chicken stew came out just like that.. 🙂 thank you for the recipe..
thanx guru… i have just completed my +2 and spending my summer vacation.. this night i decided cook something new and i finally found your chicken stew recipe.. with little hesitation i started to cook but finally i succeeded in it.. all in my home appreciated and said it was awesome.. today this alll happen only because of u thnx thnx thnx…. With bone is better in flavor compared to boneless. Nevertheless, you can use boneless too. Yummy! Came out really well and this helped to make some good Kerala stew! Was missing coconut milk and hence gave it a try with some cooking milk at the end plus a dash of coconut oil to give it that coconut milk aroma. That did the job. Next time I will follow the recipe to the dot. Love it and I am gonna stock my pantry with some coconut milk for next time! First off, thanks for being so awesome and sharing your recipes with all of us. Great job on the blog! My question is, is it really necessary to add lemon juice? Does it serve a purpose, or is it ok to omit? Lemon juice offsets the sweetness of the coconut milk and the spicy pepper corns. You can omit it. Hello Ma’am, I followed this recipe n made chicken stew the other day. It was so yum that my in-laws thot I had picked it up from a restaurant. Loved it! Thanks for sharing!! the receipe is really mouth watering YUMMY…………………..
Just made this last night and had it for lunch today. Very yummy recipe, will def. be making it again. Thank you for sharing. Hi!..I tried your recipe..came out super tasty! Thank you for sharing.